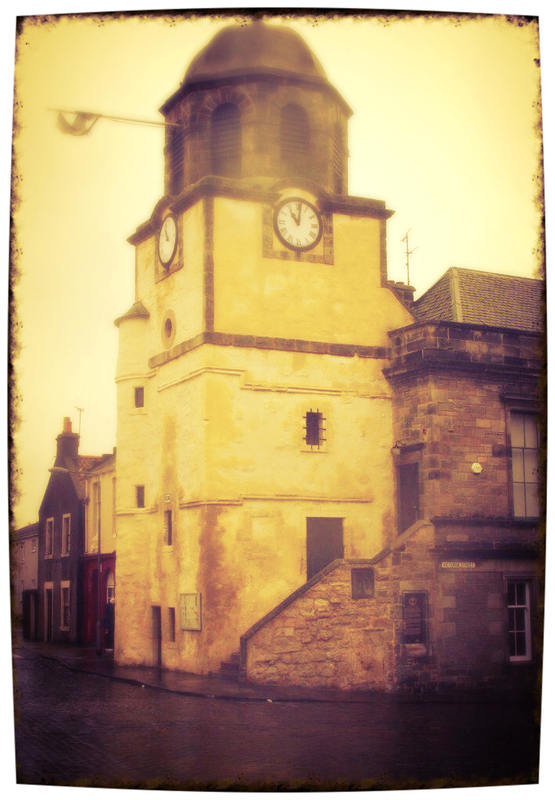 Six Word Saturday: how many ancestors have stood here? A notice from The Edinburgh Gazette, January 25, 1910 relating to my great grandfather, Thomas Elder. Source Edinburgh Gazette. I guess it’s the nature of family history that it’s much easier to find out about some ancestors than others. It’s not only that before statutory records, all information is a bit patchy, but that some people lived and died leaving little or no trace in the documentary record. The converse of course, is that when we do find some record of an ancestor’s life, it affirms their existence and makes them that little bit more real. My great grandfather, Thomas Elder has always seemed one of those will o’ the wisp ancestors about whom I knew little and wondered much. The bones of his life are laid out in the BDM and census records. He was born on 23 February 1874 – exactly ninety years before my brother’s birth. He was the fifth of eleven children born to William Elder and Elizabeth Penman. The family lived in Dysart, Fife and somehow managed to avoid having any member of the family working in the mines. By the age of 17 Thomas was employed as an Ironmonger’s Assistant. At the age of 24 he married Annie Nicholson, four years his senior and already the mother of a three year old, illegitimate son who lived with his grandmother but was – certainly in later years – part of his half-siblings’ lives and not hidden away. Thomas and Annie had three children together, my grandmother Susan, great aunt Elizabeth (Bessie) and great uncle William. The 1905 valuation roll shows the family living in a house owned by Annie’s mother. Thomas Elder died on 12 February 1929, aged only 54, of colon cancer. 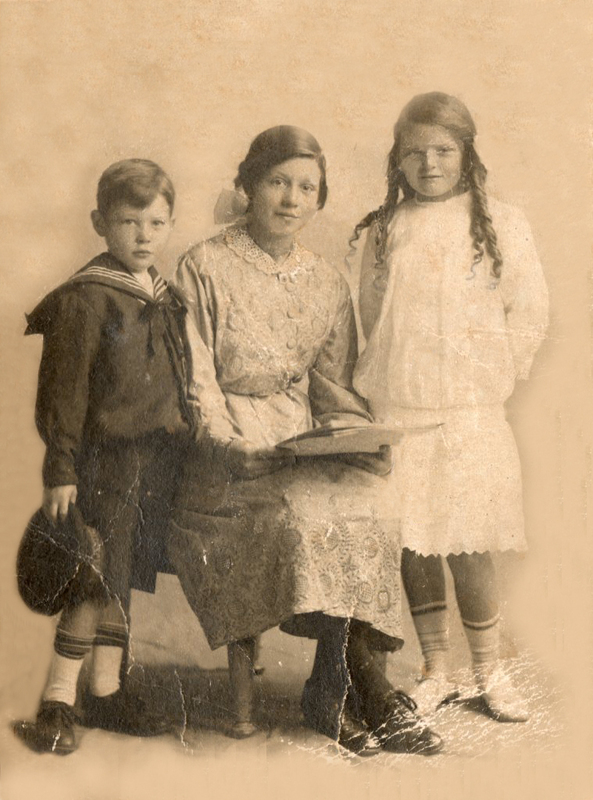 A cousin of my father’s – Aunt Bessie’s daughter – says she heard that “Papa” Elder was gassed in WWI and his health suffered greatly afterwards. I have tried to find his service records, but without success. I have little to go on; Thomas Elder is not an uncommon name and I have no idea which regiment he may have served in. Not only that, but his records may not have survived the Blitz (during which over 50% of WWI service records were destroyed). So to my random moment of delight: earlier today, on a whim, I typed “Thomas Elder Ironmonger Kirkcaldy” into Google and found the newspaper clipping above. 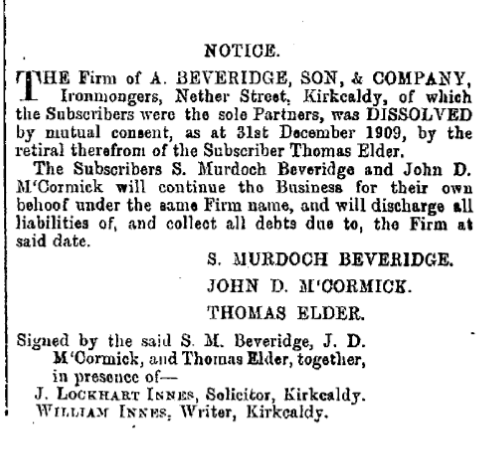 I now know that sometime after 1901, when Thomas was an employee (albeit a manager) and 1910, my great grandfather was for a few years a partner in the firm of A. Beveridge, Son & Company. Now I can search the company name and and the other partners. The question is of course, why did Thomas ‘retire’ from the business at the age of only 36? Random Moments of Delight is a blogging prompt from my friend Meghan at Firebonnet. You can find out more about it here. Six word Saturday: family mystery about to be solved? After reading that the Lothian Health Services Archive held records for the Royal Maternity Hospital, I emailed a request for access to the records of my great, grand aunt who died there shortly after giving birth. This archive is a wonderful resource for anyone who has had ancestors treated at the many hospitals and other medical facilities in the Lothian area. I’m always impressed and slightly amazed when friends and fellow family historians reveal a collection of treasured heirlooms, photographs and other memorabilia. 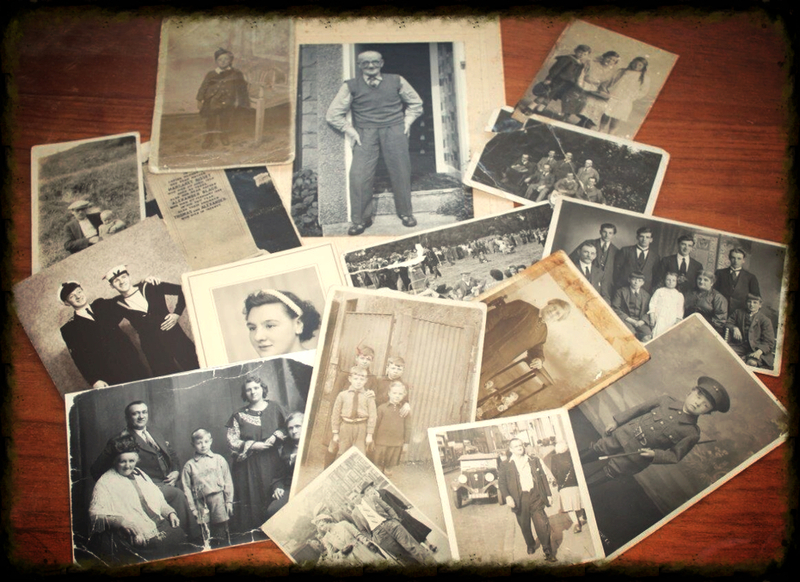 How do families keep such treasures from being lost, thrown out or sold? How do they find their way into the hands of those who will preserve and treasure them? I thinking about this because I’m now the custodian of a (very small) collection of photographs and objects given to me by my mother. At the moment, it’s all stored in an archive box, but I know I’ll need to do more not only to preserve these things now, but to keep them from being tossed out after I’m gone. The former task is easy. The latter — persuading my offspring to preserve his heritage no matter how trivial it appears, because one day he will come to appreciate his connection to the past — well, that’s the challenge isn’t it. The boy-child shows absolutely no interest in the past. His father has only recently started to wonder about his own family, and yet, I feel as though I’ve always been connected to my ancestors. 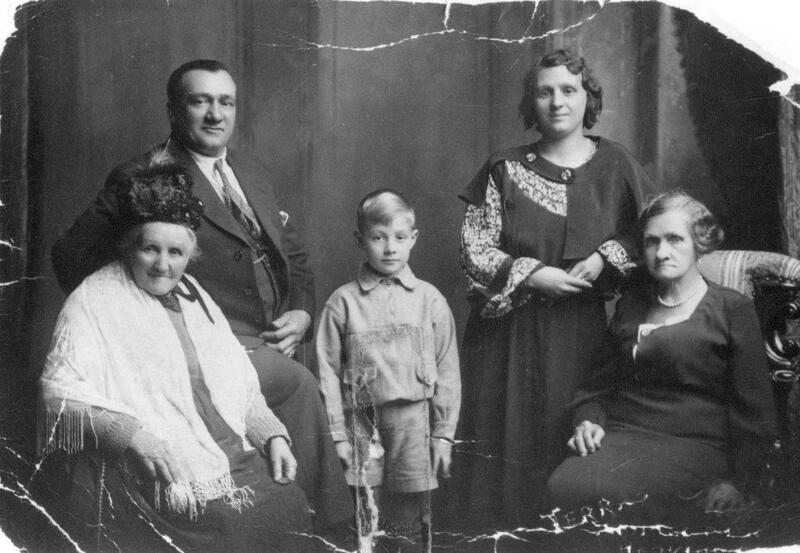 Perhaps it helps that my mother is a great story-teller, and that I actually had living great-grandparents as a flesh-and-blood presence in my life. It probably helps too that I’m a bit of a Borrower. Years ago — when I was a child in fact — I persuaded my father to give me his childhood autograph book. I have no idea why I wanted it, but suspect it has something to do with not wanting my brother to have it. It’s somehow survived my globe-trotting and years of living in rented flats. Although I haven’t consciously treasured it, I have always kept it safe — again, I don’t really know why, but I’m so glad that I did. My dad was given the book by his mother when he was fourteen. 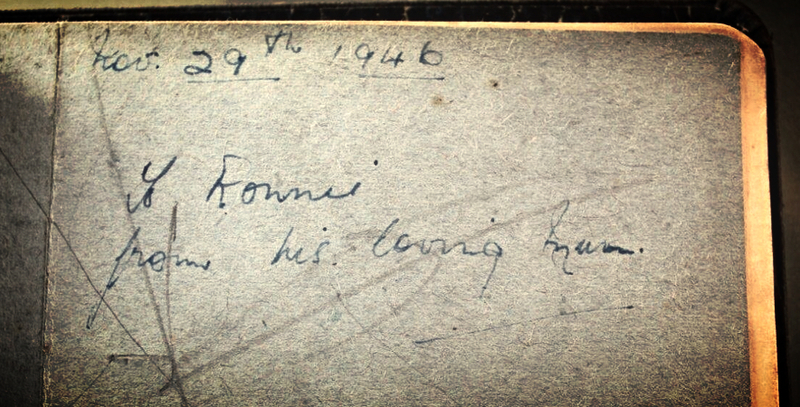 It wasn’t a birthday present — his birthday is in July and the book’s inscription is dated Nov 29th 1946. Nov 29th 1946. 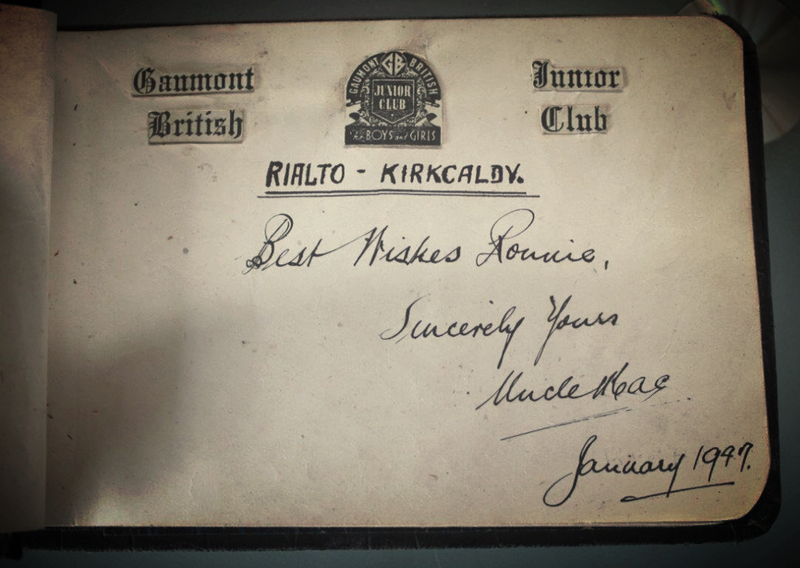 To Ronnie from his loving mum. Photo: Su Leslie, 2014. My grandmother died just three and a half years after she gave this gift. Although my father doesn’t talk much of his past, I know her death was a sorrow he’s never stopped feeling. He named me after his mother and I like to think that my family history project is, in some small way, honoring her memory. Most of the autographs in the book are footballers – mainly players for Dad’s local Club Raith Rovers, plus a few from Rangers F.C. and Celtic. I’m really curious about this entry, and will have to ask my dad which uncle it was, and about his connection to the cinema. So my dad’s little book is not only a link through him to my grandmother — giving me the only example I have of her hand-writing, but also a clue to the story of a great-uncle I may not know about. This post was written in response to the Daily Post Weekly Photo Challenge. 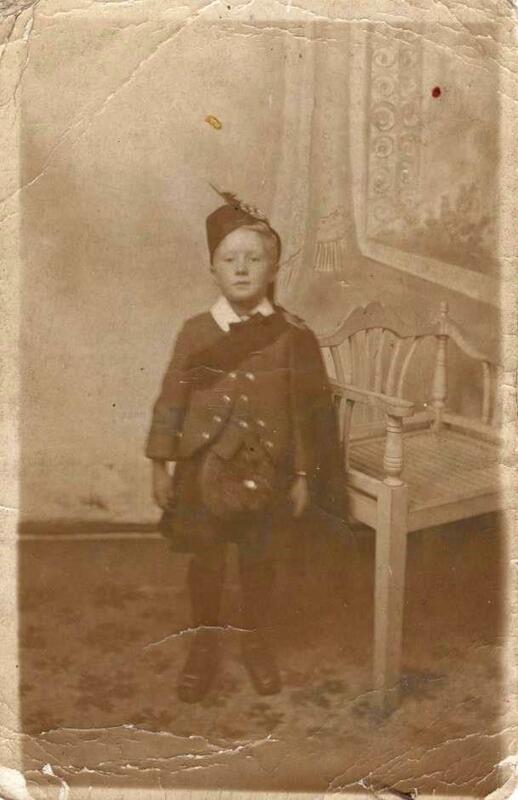 This is the third separate studio portrait of my great uncle in a kilt. There are others of him posing in little cut-down army uniforms. I don’t know whether this was a fashion in photography at the time, or my great grandparents just loved seeing their kids dressed up. Wordless Wednesday is a Geneabloggers prompt.